Lie face down (prone) with palms placed at side of the chest, hands about shoulder-width apart (shoulder width is the classic position), and feet slightly apart or side by side. The body should be straight (not concave or convex) and eyes should be fixed forward toward the horizon. From the lowered starting position, press the body upward until the arms are completely extended, exhaling throughout the motion. Lower the body downward until the rib cage is near to the ground, inhaling throughout the motion. If the elbows are pointing backward, the triceps will be more involved; if the elbows are pointing outward toward the sides, the pectorals will be more involved. There are several push-up variations, each of which will change the focus to different parts of the pectorals. Place the feet higher than the upper body to isolate the clavicular head of the pectorals (the upper chest). 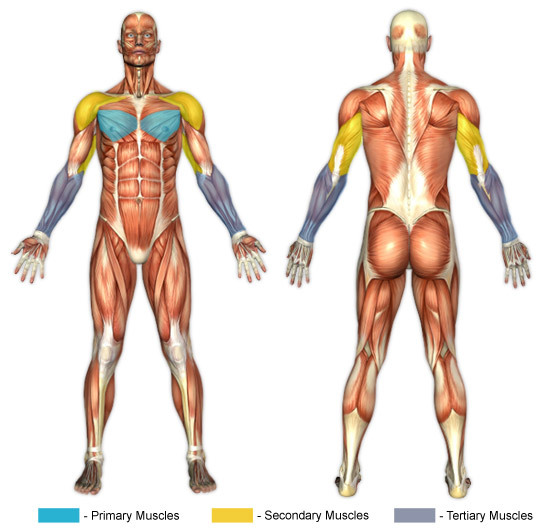 With the upper body higher than the feet the inferior part of the pectorals are isolated. Widening the hands isolates the lateral part of the pectorals (the outer chest). Placing the hands nearly side by side, under the body, isolates the sternal head of the pectorals (the inner chest). This is often called the 'diamond' position because the fore finger of each hand and the thumb of each hand will meet to form a diamond shape).